몇 달전 Linux Hot Copy(HCP) 유틸리티가 무료로 풀리면서, 고가의 스냅샷 유틸리티를 구입 없이도 얼마든지 사용할 수 있게 되었습니다. 스냅샷을 멋지게 활용할 수 있다면, 단순히 데이터 백업 뿐만 아니라 DB 시스템과 같이 복잡하게 얽혀서 구동되는 데이터도 특정 시점으로 데이터를 복사할 수 있습니다. 이 경우 Linux Hot Copy(hcp)에 대해 알아보도록 하겠습니다. 설치 파일 압축을 풀면 아래와 같이 OS 별로 설치 바이너리가 있습니다. 서버에 사용하고자 하는 설치 바이너리를 설치합니다. 이제는 리눅스 커널에 맞는 모듈을 업그레이드해야 합니다. hcp-setup 명령어로 쉽게 가능하며, 업그레이드 시 https접근(443포트)이 필요합니다. 사용법은 다음과 같이 “hcp –help” 명령어를 통해 확인해볼 수 있습니다. -h, --help             Show this help message. -l, --list             List active Hot Copy sessions. -r, --remove           Remove Hot Copy session. -m, --mount-point      Specify mount point. -o, --read-only        Mount hcp fs read only. -c, --changed-blocks   Specify changed blocks storage device. -q, --quota            Sets quota for changed blocks storage. -v, --version          Show the Hot Copy driver version. 변경된 블록들이 저장한 디바이스가 별도로 존재한다면 -c 옵션으로 스토리지를 분리할 수 있습니다. 그렇지 않으면, 스냅샷을 생성한 디스크에 기본적으로 변경 블록이 기록됩니다. Thank you for using Hot Copy! 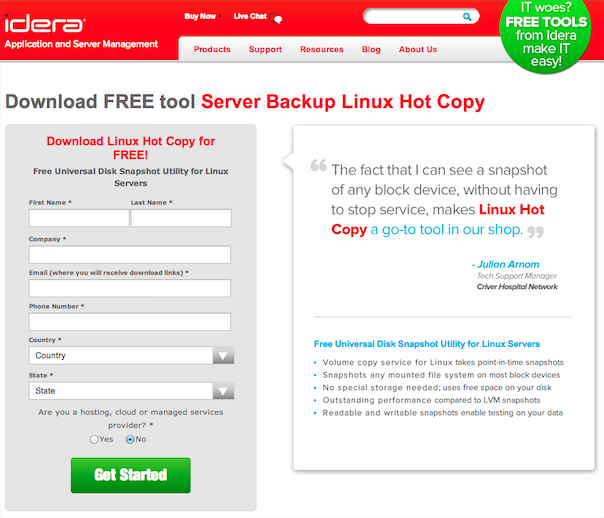 Idera makes the only Continuous Data Protection software for Linux. 스냅샷이 마운트된 포인트를 인수로 줘서 스냅샷을 삭제합니다. Hot Copy Session has successfully been stopped. All active Hot Copy sessions have been stopped. It is now safe to restart the Idera Backup Agent. HCP 스냅샷 유틸리티를 활용하여 DB의 시점 백업에 활용할 수 있는데, 다음번 이야기에서는 이 내용을 포스팅하도록 하겠습니다. This entry was posted in Research and tagged backup, hcp, snapshot on 2013-12-10 by gywndi.